The lingerie industry is changing; many would agree for the better. Since the 1970s, fashion icon Victoria’s Secret has been the what’s-what in all things women’s underwear. By sheer market share, VS is still the dominant force. But new entrants are bursting onto the scene. They’re touting an entirely new message – and proving they’re ready to play - and win - against anyone. Women around the world are buying in. And while Victoria’s Secret faces consolidation, store closings, and weakening sales, there are new entrants like Soma, ThirdLove, Lively, and more that have been posting month-over-month growth virtually since day 1. Unfortunately for lingerie sellers – both traditional retailers and the spunky, young upstarts – a little online vendor called Amazon caught wind of the lingerie “return to basics” trend. And they’ve decided they want a piece of the pie. As a result, Amazon is entering the market with a private label lingerie brand called Iris and Lilly. The label is available now in the UK with a limited assortment of sizes and colors. There are plenty of reasons why Amazon could run away with this industry (sophistication of data operations, ability to scale, unrivaled distribution infrastructure), but still, there are plenty of ways they could flop. If you believe at all in the power of personalization, then what category could be more intimate than lingerie? Scrappy new upstarts that leverage AI and deliver personalized experiences could leverage Amazon's achilles heel to win. Regardless, surging aspiring lingerie retailers need to do more than hope for the latter scenario. How sad it would be to show promise of misplacing one retail titan, only to be squashed by another. Are you going to mosey along blindly and let that happen? Or, will you leverage today’s new data science advancements and AI to outmaneuver the behemoth(s)? We loaded more than 19 lingerie competitors into our artificial intelligence marketing platform to analyze all the digital sources driving qualified lingerie buyers into the underwear ecosystem. 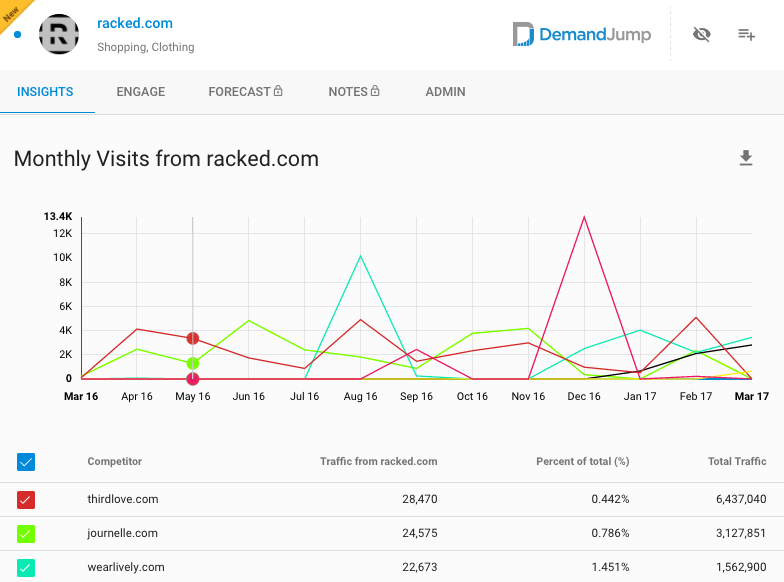 We identified 28,900 sources of traffic, that account for hundreds of millions of visits and a good chunk of the $110B global underwear market (2015). What we found is that when it comes to finding qualified traffic, there are compelling gaps in the way these lingerie sellers are going to market. And gaps aren’t going to fly when Amazon comes to town. Lingerie retailers need to uncover every possible source of visitors – both in-store and online – and convert those visitors into revenue. One such gap that jumped out at us. Blog websites. Lingerie brands, new and old, are doing a noticeably poor job in capturing traffic from blogs and influencers online. DemandJump researchers have spent countless hours analyzing data from the most popular categories across the broader fashion industry. Blogs are nearly always a major source of traffic, often cited as a key battleground amongst fashion brands. Spoiler Alert: Top blogs across the entire lingerie category rarely drove traffic to more than one competitor. And this traffic was sporadic; often peaking for a month or two and returning to near zero. Not only can we use similar industries as a benchmark to determine lingerie is underperforming on blogs, we can also use the normal spikes in traffic that occur within the lingerie ecosystem itself. For example, in certain months, we see massive spikes in traffic generated from one or more blog sites. However, that traffic quickly falls off in ensuing months; in some cases, plummeting to near 0. Take the above example of wheretogetit.it. This blog site drove traffic to fashionnova.com in bundles during July and August – to the tune of more than 300K visits per month. However, immediately following this spike, the traffic patterns fall off and return to 0. There seem to be no rhyme or reason for this lack of consistent engagement with blogs across the lingerie industry. Blogs and influencers have proven to be a valuable traffic generator; both in fashion at large, and within the lingerie niche. But, to stay relevant as eCommerce giants like Amazon enter the space, blogs need to be an important part of your ongoing digital strategy. At a high level, there are two main steps involved with building a traffic strategy inclusive of blogs. Step one is to identify which blog sites have the biggest potential to drive your brand a high volume of traffic. 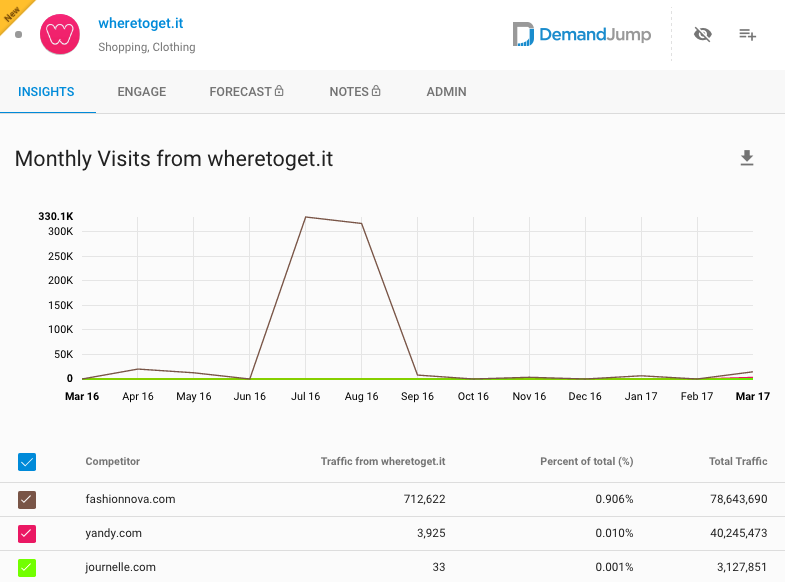 Shameless plug for DemandJump: we can show you exactly which blogs are driving the most traffic to your ecosystem already; including to your competitors. With our solution, create a whitelist of the top blogs you need to engage, so that you don’t waste time with sites that aren’t going to deliver qualified buyers. Step two is going out and engaging with those blogs. There are many opportunities, including paid advertising, sponsored content, or even, good ‘ole fashioned influencer outreach. The best option for you will depend on your goals. Monitor these relationships carefully, and press the gas hard on blog sites that drive the highest return on investment. When we follow up on this post in a few months, we don’t want to see these sporadic spikes and falls. We just want to see clean, steadily-rising traffic across these valuable traffic sources. Already in the midst of a shakeup, lingerie is in for yet another big change. Amazon. With the ability – and frankly, the precedent set – to displace an entire industry, lingerie challengers need to explore all the marketing channels and then focus on traffic sources that will drive the highest return on investment. Be sure you are leveraging AI insights to know precisely where to invest your dollars to grow revenue and marketshare - and where not to waste your time. To stay relevant, brands like Soma, Third Love, Adore Me, and others will need to act quickly, adapt in real time, and focus their efforts/budget on the most efficient sources. Amazon is not unbeatable. The new go-to-market messaging for lingerie is resonating. And many women will not be willing to buy their most intimate apparel from a $600B eCommerce tycoon, or from its sidekick, Alexa. Winning at lingerie sales won’t be easy though. If you’re in lingerie, what are you doing to position yourself for success?